As of June 2018, this website contains more than 82 pages, 1300+ posts, and over 57,000 comments, not even counting the WCI Forum. It’ll only get worse in the future. The readership continues to grow and thousands of new readers visit each month thanks to word of mouth, other websites, and the ever popular Google. I understand that it can be overwhelming to arrive here and not know where to start. The archives page can be very helpful. It lists posts both by date and by category. If you’re looking for posts on a particular topic, type that topic into the search bar at the top right of every page. On your first few visits, however, I suggest you start with some of the posts below. They will give the new reader a starting point to get up to speed with the other readers. I’ll list both popular posts and those that will help you do something today to improve your financial situation! Other great ways to get up to speed include reading The White Coat Investor: A Doctor’s Guide to Personal Finance and Investing and/or taking the comprehensive Fire Your Financial Advisor online course, which will take you from knowing nothing to having a written financial plan you can follow from now to financial independence. Reading through some or all of these posts will get you up to speed quickly and accustom you to the tone and subject matter of the blog. Sign up now for the FREE monthly e-newsletter and a copy of all new blog posts in your email. 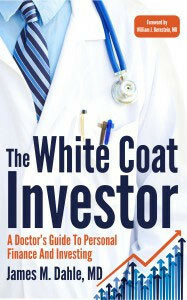 The White Coat Investor: A Doctor's Guide To Personal Finance And Investing not only summarizes the most important information on the blog, but also contains material not found on the site at all. A step-by-step process to creating and implementing your own financial plan. What Do “Advisors” Think About Doctors? Should You Make Traditional or Roth 401K Contributions?